John Trumbull's Declaration of Independence is a 12-by-18-foot oil-on-canvas painting in the United States Capitol Rotunda that depicts the presentation of the draft of the Declaration of Independence to Congress. It was based on a much smaller version of the same scene, presently held by the Yale University Art Gallery. Trumbull painted many of the figures in the picture from life and visited Independence Hall as well to depict the chamber where the Second Continental Congress met. The oil-on-canvas work was commissioned in 1817, purchased in 1819, and placed in the rotunda in 1826. The painting is sometimes incorrectly described as the signing of the Declaration of Independence. 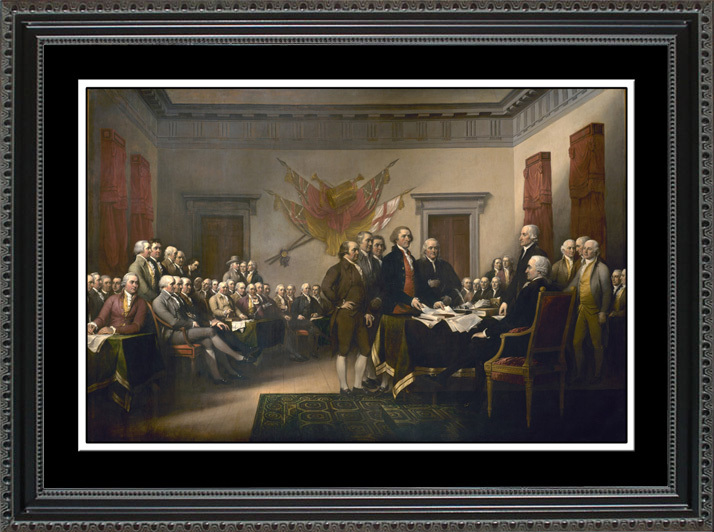 In fact, the painting actually shows the five-man drafting committee presenting their draft of the Declaration to the Congress, an event that took place on June 28, 1776, and not the signing of the document, which took place later. Image size is 17" x 11"
Overall frame size is 22-1/4" x 16-1/4"
Great office art for the lawyer, judge, attorney, paralegal, or law clerk. 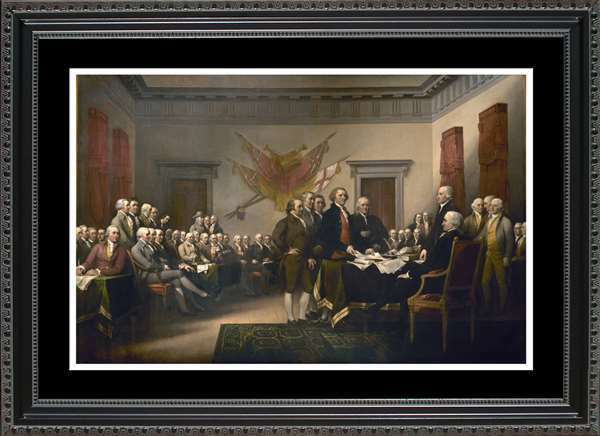 Our art makes a great office wall hanging for historian, American History buff, or patriot.